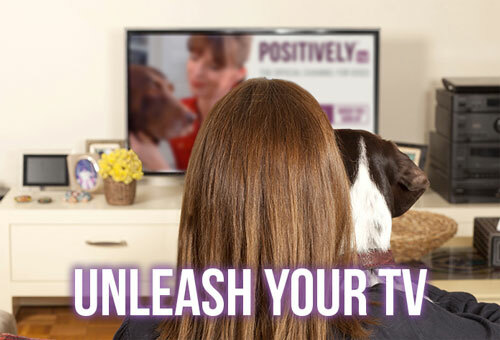 Home >> Positively Contributors >> Digging, Chewing, Chasing, Barking: Instinctive Drives You Love or Hate? So too with many of the behaviours we see in our dogs. Taken to excess, these compulsions would become annoying or even dangerous. But if you can accommodate them - by giving your dog an outlet for his natural inclinations - you’ll have no trouble with them. Don’t fight nature! Particularly evident in earth dogs - terriers, ratters - though by no means confined to them. Provide digging opportunities for your digger. • Half-bury old bones, plastic bottles and such like in a part of the garden you earmark for digging. Don’t leave your dog outside unattended - telling him off after the event is a waste of time. As soon as he starts digging, run excitedly to your dig-spot and start digging yourself. Encourage him to dig himself to a standstill! • Indoors you can play “Dig for the Toy (or Person) Under the Duvet” games. Be sure to protect the person’s face from those ravaging claws. This exciting game usually results in much laughter all round! Let them dig their bed to bits. Instead of one boring piece of padded bed, give them lots of cushions and blankets they can rearrange and tunnel into. They enjoy the release of energy in ferocious digging, so they need to be able to do it. So what if they damage their bed? It’s their bed. And you can get a new one if they shred it. • Digging often wanes with age. My Border Collie Rollo used to pounce on the grass and dig as a puppy - clearly he could hear something creeping about in the earth. He lets the underground traffic of mice and beetles carry on unheeded now. I captured the entertaining pouncing action though, and he’ll still rear up and dive when I say “Rabbit!” Cricket the Whippet enjoys digging so much that she is encouraged to dig her bed, and we’ve kept that behaviour of frantic digging going - long past puppyhood! • Large bones she really has to stand on and fight with are the very, very best and most popular chew toys. Choose raw beef bones - ribs or larger. She’ll soon strip off anything fleshy and happily gnaw the clean bones for months. I have a multi-dog household and there are never any bone-fights. • Rawhide chews are not the natural product you may think them to be. They’re heavily processed and may have lots of additives and junk. • Food-toys are great to soothe anxious chewers and occupy those jaws safely. You can use anything you have handy to fill them: squeezy cheese, liver pate, peanut butter (additive-free), last night’s left-over pasta and sauce. Freezing them makes them last longer. Kibble works well in containers that have to be rolled or wobbled to give up their bounty. • All discarded containers (like cereal boxes, toilet roll middles, plastic bottles, for instance) can become food toys. The dogs are welcome to shred them and rip them apart to reach the goodies inside. Ripping and tearing is enormously satisfying for them. • I would not want to give my puppy anything to chew now that I didn’t want her to chew later. Old shoes, old jumpers, best Jimmy Choos, favourite blouse: how can she tell the difference? You can launder and recycle old clothes into plaited dog ropes. • Equal chasing - taking turns to chase each other - makes for great excitement. 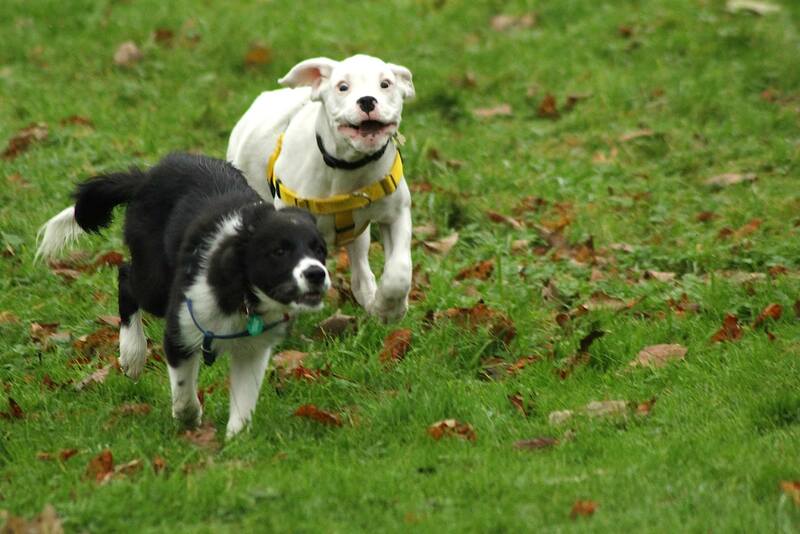 In a good game dogs will adjust their pace to suit their playmate. They take turns at being chaser and chasee. The game can be fast, but not intense. • Flat-out, head-down chasing - leg-biting, flank-grabbing, frustrated barking - are not good. You’ll end up at the Vet with a dog needing stitches. Teach your frustrated chaser to hold a toy in his mouth when chasing. Hanging on to the toy gives him something else to focus on and bite down onto. It muffles the woofs too! If he can’t chase nicely, with or without a toy to hold, then he doesn’t get to chase live things - dogs, people, cats, etc. Some herding dogs and sighthounds need to learn how to chase safely, without nipping or grabbing. • Chasing crows. As long as the area is safe I’m happy to let mine chase foraging crows off the ground. They’ll never catch them, so the birds are in no danger. This tends to be a puppy thing, as they give up the unequal contest after a number of failures. 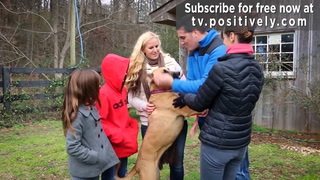 But it gives the dog an outlet for that very rewarding surge of energy and focus that comes with a good chase. • Teach your dog to chase with rules. A flirt pole is ideal for this. He may not grab it from the air or your hand - he has to wait till you release him to pounce on it. You can build up to this level of self-control. To begin with it will be a massive outlet for his chasing desire. It will also wear him out very fast - great for days when there’s too much energy and too little opportunity to get out and use it up. Regular play with the flirt pole gives my whippet an outlet for her very strong rabbit-chasing instincts, making recalls off rabbits a snap. 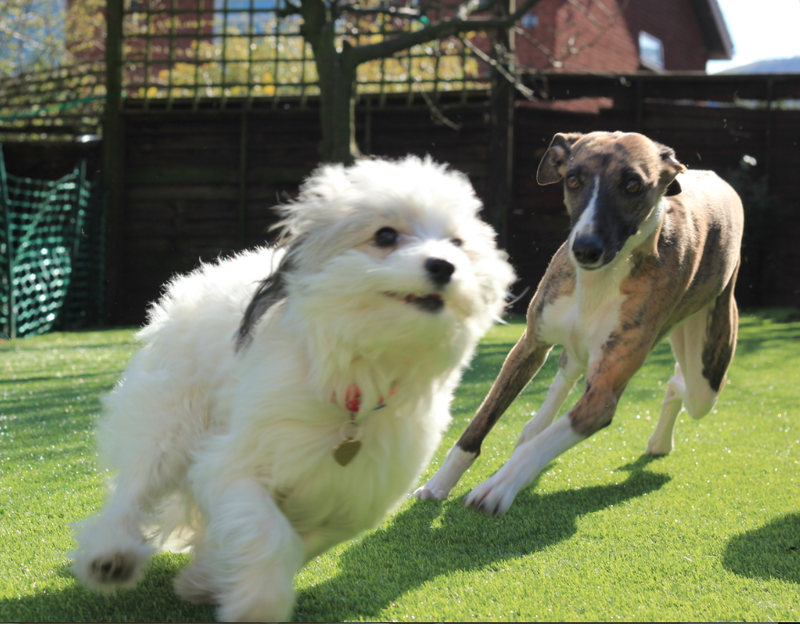 • “You can’t catch me!” A chase game round the garden with a toy reward can be great fun and use up a lot of energy (for both of you!). 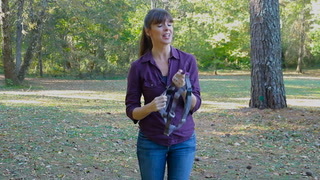 As long as your dog will come right to you when you want to hold her collar, playing Keep Away is fine. • Teach your dog to bark on cue. “Woof!” followed by “Quiet!”, repeat till your ears are ringing. • Pair “Thank you” with a treat. Then thank your dog for alerting you to the serious danger of the mother pushing her pushchair down the road past your house, or the terrifying prospect of invasion from the postman. Reward her for coming to you when you say Thank you - every time. Quite soon you’ll have a dog who draws breath to bark, thinks again and comes trotting to you for a treat. Be sure to reward her mightily for this excellent decision! • As soon as your dog starts barking, toss some hard treats or kibble at a hard surface (door, hard floor, cupboard door). She’ll scurry across to gobble them up, and probably look at you for more. Now you have silence and her attention! And all without shouting, yelling, or barking yourself. • On our own in a huge forest or an empty beach is the place where my barkers are encouraged to bark themselves silly.